The holidays are on their way out and a new year is on its way in! What better way to start a new year than by getting something for free????? Or should I say, what better way to start a new year than by some things for free???? January 21-22, 2011 marks the Arizona Family History Expo in Mesa, Arizona. I have several reasons to be happy about this: I get to share my experiences with researching my ancestors as people with others as a presenter! I will speak about the role of culture in our research and about the use of genograms in genealogical research. The Az Family History Expo offers my three classes free to those who pay for either a day pass or a full Expo pass. It also offers 97 other topics! Yes, you heard me right, NINETY-SEVEN. That makes an even 100 workshops. There literally is something for everyone. And there's more: The exhibit hall presents the genealogy enthusiast, hobbyist, and professional with a plethora of tools, information and materials that make our task much more fun, and easier to boot! 1. What is currently your biggest brick wall in your genealogy research? 2. To date, what has been your biggest genealogical accomplishment? Describe how you did it! 3. What is/are your genealogical goal(s) for 2011? The winner of the TWO FREE TICKETS to the 2011 Az Family History Expo will be decided based on a random drawing of all entries received before Wednesday January 5th! 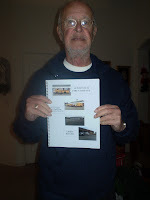 Disclaimer: I am both a presenter and a Blogger of Honor at the 2011 Az Family History Expo. As such I receive compensation in the form of a paid entrance to both days of the conference. My promotion of the Expo is both expected and willingly provided; however what I post about it is entirely up to me and I do not receive any compensation for what I post. I promoted the Expo in 2010 without any expectation to do so, and anything I do post is a product of my own experience. One thing I've always hated about Christmas shopping, was trying to figure out what to get people. My parents were easy enough; they liked (or pretended to like) anything we bought them. My middle brother wasn't too difficult, either: I always managed to find a good sweater or shirt that suited his personality and color schemes. My oldest brother, however, well, that was a different story. I never knew what to get him. If I asked him what he wanted he'd either say "Nothing" or worse, "A bowling ball" or "Golf clubs", which was worse than him saying "Nothing" because they were items way too expensive for my cashier's wages. As I grew older I learned that getting gifts that mean something to the recipient was the ultimate Christmas Shopping experience. Christmas 2009, I must admit, was the easiest year I've ever had in terms of deciding what to get. My dad had been living with me for three years, and he was getting to that point where reflection on the life he'd lived was a common topic of conversation. One day I was searching Facebook for childhood friends, and cam upon a FB page for "Colonial Village Elementary School" where I went as a child. On that page was a link to the FB page for the Lewiston #2 Fire company, where my dad spent many years as a volunteer firefighter. As I was browsing the photos on that page I saw a T-Shirt for the station members that I thought dad would just love. So I FB messaged a member of the Fire Hall listed on the page. 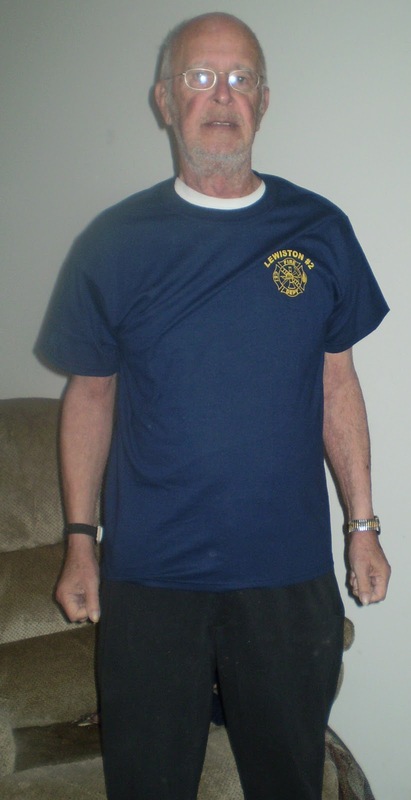 I asked if I could purchase a T-shirt for my father and explained that he had been a volunteer firefighter there and that the Fire Hall played a big part in my family's life when we'd lived in Niagara Falls. The response I received from the member and her husband was they'd try to see if any t-shirts were left and if so, they'd send one. They could promise a fire hall patch either way. About a week and a half later a package came with a t-shirt and a patch. I wrote to the fire hall's contacts I'd written thanking them and asked how much to send them and where. I was told to offer it too my father as thanks for his service. Knowing the Fire Hall and it's members still hold on to the values of the Village in which I was raised was a great Christmas Present in itself. I wrapped up the T-shirt and patch for Christmas. 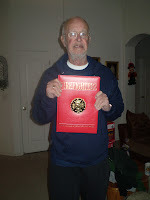 I also searched the Fire Hall's webpage and created a little booklet about the Lewiston # 2 Fire Department's history. I couldn't wait to give him his gifts! As another pleasant surprise, I was browsing Barnes and Noble that same week and stumbled, quite by accident, upon a coffee table book on Firefighters, published by the National Fallen Firefighters Foundation. It is a fascinating book on the history of firefighting and some really great photographs. As it turned out, Christmas 2009 was to be my father's final Christmas on this earth, as he'd fallen ill about a month later. He was so proud of his firefighter gifts! And, though I've always been excited to give gifts to others, no single Christmas drove home the Reason for the Season for me than Christmas 2009. 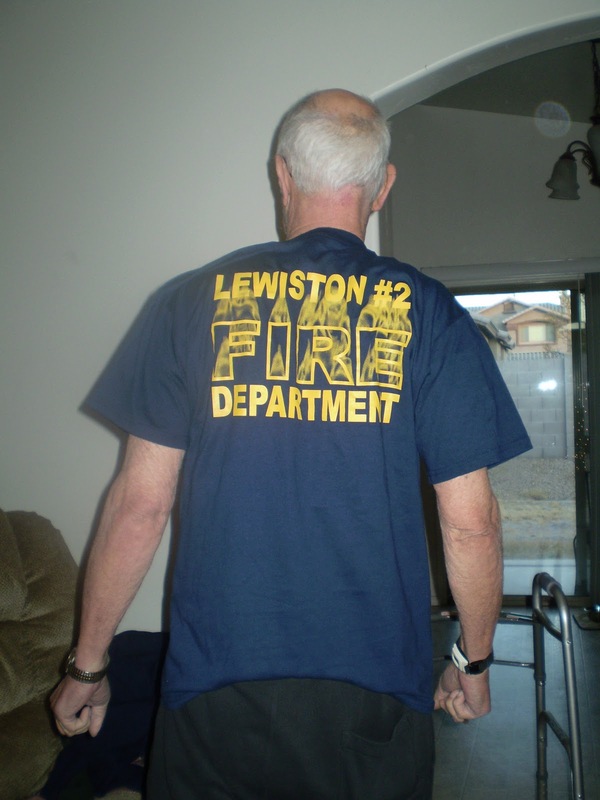 Thank you, Lewiston #2 for giving my father a gift he was truly proud of. (P.S. : I still have the t-shirt and wear it occasionally). Growing up, we didn't do much volunteer work at Christmas time. We put more efforts into volunteer work throughout the year than we did at Christmas, mostly through the fire hall. I grew up on Garlow Road in Niagara Falls, NY. We lived in the Town of Lewiston and my father was a volunteer firefighter at Lewiston #2 Fire Department for many years. The entire station was volunteer based, and still is. We also tried to help people out as the need arrived. The winter of 1977, our last in Niagara Falls before moving west to Tempe, Az, was especially trying. There was a huge blizzard that year that not only closed down the schools for weeks, it closed down the entire city. Advisories were released pretty much banning non-rescue persons from being on the streets. A family we'd known experienced a major pipe freeze and burst in their home, and we were able to take them in for a while. I remember how stressed my mother was, what with her own three children plus the two children I think it was, that the family had. But I also remember her saying that regardless of how stressful it was for us, it was more stressful for the displaced family. The clinic where I work participates in the Toys for Tots (TFT) program every years as a distributor of gifts to families in need. We are only able to distribute to the families who use our clinic but we refer to community agencies for those we hear about that need the help but are not our families. It's such a worthy cause, and it's so simple in theory. In recent times, however, the TFT program has really been hurting. Last year our clinic had 850 families signed up for the program, but the program was only able to provide a few hundred toys. Our clinic is fortunate to have a generous Board and a very generous philanthropic foundation, Square and Compass, to assist and we were able to provide for the needs of our families. My father purchased several toys last year and took them to the local fire station that serves as a collection site for Toys for Tots. I wish I had been there to see this; his telling of his "adventure" was precious and I know he was proud to be part of the program. And to drop them off at a fire station, well, that was just icing on the cake! This year we have over 1,000 kids signed up, and our Board and foundations will once again assist in meeting the need. If you have similar programs near you, please sign up for either it or other similar programs to help elderly people have some surprises at Christmas. What is/are your Christmas Collections? 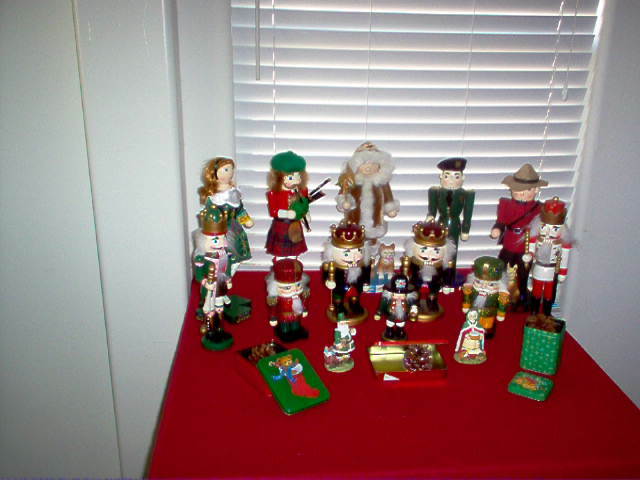 (I have another collection, which I'll save for a later Grab Bag from the Advent Calendar of Christmas Memories). This will be my third consecutive year attending the Arizona Family History Expo in Mesa. Last year was my first year as a presenter, and this year I've been invited to present again. I've also been given the opportunity to be a Blogger of Honor at this year's event. I'm thrilled to associate with the Geneablogging community, and this is an exciting opportunity. Last year I facilitated a presentation entitled "When Past Meets Present to Change the Future: Using Genograms in Genealogical Research". This year, that same talk will be the third of my presentations. I chose to repeat it this year because it makes a very good "wrap-up" to my two new presentations, which is a two-parter entitled "Learn About YOU by Learning About Them: The Role of Culture in Genealogical Research". As you can tell, I like long titles! In my professional life, I am a social worker. I work with children, teens and young adults who have complex health care needs and/or disabilities. I want to know more about people than their names, dates of birth and ages. I want to know who they are, what makes them able to manuever through this life, and what lessons they can teach me. My genealogical goals are much the same: I want to know who my ancestors were as people: What did they look like? What were their interests? What traits might they have had that I share? These goals and my professional training lead me to the topics I wish to explore. I hope to see many of you in Mesa next month. And to increase the chances of my seeing you there, I will have a few incentives to give a few people. Stay tuned! I remember believing in Santa Claus. It was so magical! Unless I was going to sit on his lap, then it was terrifying. So terrifying that, in fact, I never sat on Santa's lap.Even when Santa turned out to be Grandpa, I wouldn't go. But I sure believed in him and I sure as heck did my best to please him. One year on Christmas Eve we were heading home from Grandma and Grandpa McHugh's house. We were driving along the reservoir when all of a sudden I saw it: Santa's sleigh. We were close to home by the time I saw him, complete with Rudolph's glowing nose! I remember yelling at dad, who was driving: "Hurry! He's over our house and if we're not in bed before he goes down the chimney he'll pass us by!!". Well, okay, so I don't remember saying those exact words, but that was the jist of my incessant screaming. We got home, we went to bed, and we woke up to presents. I presume the children of the helicopter pilot that was flying over our house the night before got their presents, too. This is a repost from my December 2007 Advent Calendar posts at The Oracle Of OMcHodoy. Yesterday I messaged several of my cousins, including those on the Hodick/Kovaleski lines, asking if anyone knew of any foods or recipes from the grand and great-grandparents. My first cousin Sue remember Kanaidels (I'm usually a good speller, but not with German words! ), but no recipe yet. Oh how I wish I could remember what food Grandma (HODICK) McHUGH used to put out! I remember very little, however, other than the cookies. So I asked dad to help me out a little. Christmas Eve was when we got together at Grandma and Grandpa McHUGH's house. My parents, two brothers and I would go, as well as my dad's sister, Aunt Norie and her husband, Joe and their two children Paul and Susan. And of course, Aunt Maryann was there, too. To dad's recollection, Grandma always served Ham, Potatos, Sauerkraut and carrots as the main meal. The only part of this I remember is the Sauerkraut. I also have a recollection of -- God help me on the spelling here -- Pfeffernuesse Cookies (thank you, Google): those soft-ish ginger type round cookies covered in powdered sugar(pictured above, courtesy of www.marions-kochbuch.de/rezept/1462.jpg). She also had peanut butter cookies and something dad thought was called something like Kalochi. 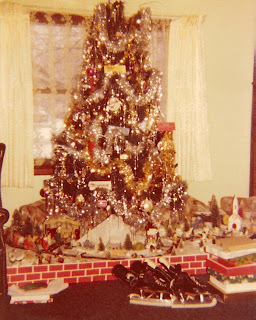 The only other food thing I remember about Christmas at Grandma McHugh's were the hard ribbon candies. 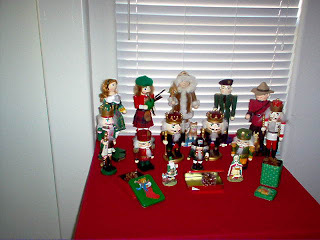 She had those every year, in every corner of the house! Candy canes, too. Last year I saw a tin of those ribbon candies and just had to buy some for old times' sake. Christmas dinner at the O'ROURKE's house, if I remember correctly, was traditional turkey dinner. Turkey, stuffing, potatos/gravy, the whole thing. A few years ago some friends and I decided to have a Christmas Cookie exchange. I learned quickly that I do not know how to bake. I wound up tossing the sugar cookie I attempted to make and going to Target to get some Christmas Tins with cookies in them. For the recipe I had to bring with my cookies, I typed up the instructions for driving to Target to get the tins! I have since learned how to make the Mexican Wedding Cake type cookies and those other cookies that have the Hershey Kiss in the middle. And this year I learned how to make pumpkin rolls! 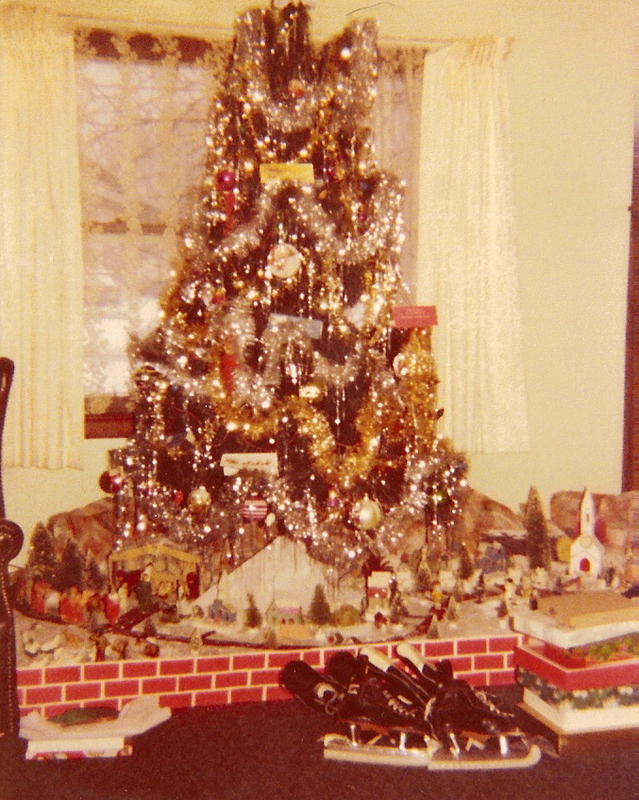 You can see that the tree is loaded with ornaments, envelopes, garland, and icicles. But underneath the tree was the real treat: On the left side of the tree (as you look at it) were houses, a school, a library, and even an ice rink with skaters. On the right is a church and attendees. It was all connected by a walking path (made of dirt if there'd not yet been any snow and coffee if it had snowed) with mountain paper in the background. Most of the village buildings and the church, and the mountain paper belonged to my father's mother Mary HODICK when she was young. It was passed down to my father, and I believe then to my middle brother. It's very sad for me to say this, but I have no idea whatever happened to this village set. 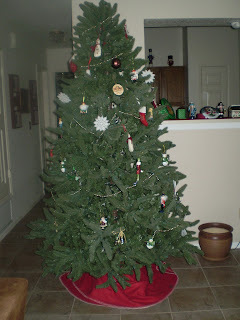 It's still an artificial tree (with my lack of a green thumb I'd burn the house down with a dry tree within a week). Only now it's pre-lit so I don't have to struggle with strands of lights on the inside of the house like I do on the outside. 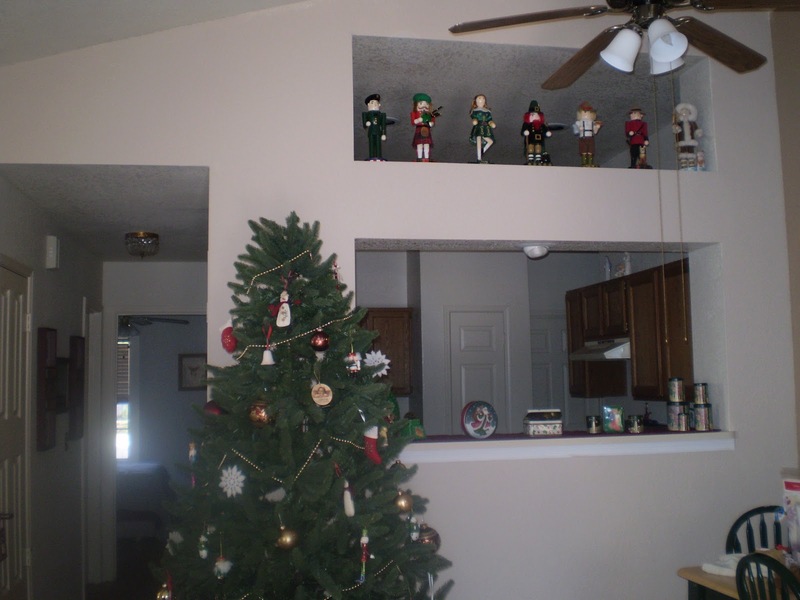 But you will see only beaded garland on my tree, not tinsel garland. And you will never see icicles on my tree: Not only is tinsel and icicles a huge no-no when you have a destructive chewer dog like Izzie, I simply have no desire to keep picking up the icicles into the following JUNE! 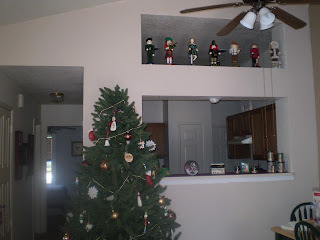 And not only are the majority of my ornaments on the upper portion of the tree (the lights make it look less obvious when they're turned on), there is nothing under the tree except the skirt -- WHICH, I'll have you know, I've not been able to have in the first four Christmases with Izzie! And I will not be able to put presents under my tree as long as I have my paper-loving dog living with me. I hope it's a long stretch of time before I can put presents under the tree again!